I have very fond memories of the first summer that my family moved to a new city in my fourth grade. My brother and I didn't know anybody; we hadn't started school yet, I was confined to a cast with a newly broken arm and the summer heat was so overwhelming that some days, playing one-on-one in the driveway was out of the question. So, often we would stay chilled in the living room air conditioning of our new house and listen to the nearby radio high school radio station blare through the speakers - calling in (because we could actually get through) to request songs by our mid-90s alternative rock favourites to pass the time. Our favourite tune to request, hilariously, was "Volcano Girls" by Veruca Salt. This screechy girl-rock anthem of the time was just angsty enough - while still incredibly poppy, now that I think about it - to amuse our bored ears while we waited for the heatwaves to pass. I think this kind of upbeat female rock was a natural stepping stone into my love of The Cardigans, Cat Power and more - but I can most definitely say that my rocker chick infatuation stems even further back than the fourth grade. 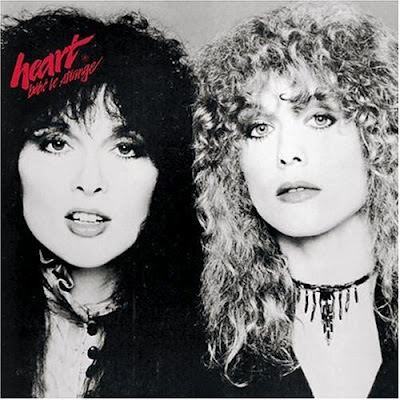 Even before those quiet summer afternoons, I grew up obsessed with Heart. The wild Wilson sisters were a staple in my Mom's discography; a collection of tunes so vast and eclectic that it's only natural music became my first love. To take a glance at my Mom - a loving nurturer who also happens to throw down in contractual law by day - you would never suspect that her and I spent evening upon evening cooped up in my bedroom while she played the classics on her guitar and I sang along. She really, really could not get any cooler. And this right here was one of the greats that she introduced me to. From the first time I heard this scorcher and air-guitared alongside Mom, right up until present day and this rare 1976 performance being re-released from the vault - I still get tingles and chills when Nancy Wilson's timeless acoustic riff cues the first boom of the electric guitar. Everyone knows it, everyone loves it; this song is irresistible. Rock on, girls.